It’s come to my attention that I’m a little behind schedule. I didn’t have the energy to pull together a favorite things post to schedule for when I was traveling. Then we got home and I spent a week going to bed at 7:30 pm because of jet-lag. Then I … then I … then I … filled my time with other things. Here we sit on October 21st and I’m just now posting my collection of favorites for this month. Thanks for eagerly anticipating what I’ve got to share. My thoughts and reflections on our trip are stewing and I’ll post soon. Until then, pick up one of these books, bake some pumpkin bread, or use these tools to plan an adventure. It’s a big world out there. I just started reading this book for our book club. Set in Denver, just an over an hour away from where I live, this journalist’s account of refugee students attending South High School is grabbing my heart. Humans live through amazingly horrific things. We need to be tender. We need to be kind. We need to be aware. I’m only 100 pages in and keep turning the pages. This book was incredibly popular when I was in college. The girls I lived with in our Christian dorm could not stop talking about the story line. I wasn’t ready to pick up the title then – my own faith wavering in big swirls of doubt. Years passed and for some reason, I was ready. I read the book on our long flight and murmured, ‘yes, yes, yes’ to the metaphors portrayed in these pages. God sees us in our suffering and gives us grace where we need it. For those doubting God, fearing faith, or feeling a bit hopeless, this story may be the spiritual hug you need. Getting ready to travel abroad? After scouring the internet and starting at selections at travel stores, a friend generously lent me her travel adapter taking my stress away. This little adapter worked perfectly to charge our devices in both the UK and France. It’s size makes it easy to carry and easy to change between power sources. Note – this does not convert voltage which lead us on an interesting adventure to sketchy electronics stores in London. It’s baking in the oven right now. I like the recipe from Recipes from Minnesota with Love. I wrote about it last year too. Cut the sugar down to two cups. With the chocolate chips, the bread comes out plenty sweet. I’m not a big souvenir girl. Picking a special something feels overwhelming when I travel and I don’t need another glass, or keychain, or vase. After spending an afternoon at Fragonard and their interesting perfume museum, I did treat myself to a little bottle of French perfume. The little gold bottle, the spritz on the wrist, the memories a scent creates. Worth it. And yet, still odd because while I bought my bottle in France, I now know you and I can get the next set on Amazon. Ahh globalization. Thank you again to everyone who contributed their lists of good things in your worlds. Keep searching. It has always been my favorite month. Those advertisers may make fun of us for our love of pumpkin spice, our UGG Boots , or the black leggings and denim button up outfit. The leaves are turning, and falling in my backyard. The light is changing and life continues to transition. Soon, I’ll opt for a warm latte instead of iced. Truth is I don’t really love the aftertaste of Pumpkin Spice lattes, Colorado girls make fun of California girls who wear UGGS, and it has really been too warm to wear scarves, or even long sleeves. Instead I’m dreaming of these things. Here is my list of things to love in October. Yes. Starchy blocks of dyed sugar. Yes! I have a hard fast rule that I’ll only eat the crap in October, and I must wait for the 1st to roll around before I’ll purchase a bag. A handful a day keeps the October haters away. The little condensed sugar pumpkins? Even better. This story technically takes place in September, but it counts. Historical fiction that blends story from 1911 to September 11, 2001. A story with heart that kept me on the edge of my seat. Or rather in my seat, turning pages. I don’t like Pumpkin Spice, but my gosh do I love pumpkin bread. We have a family recipe from the Recipes from Minnesota With Love cookbook that is heavenly. Cut the sugar in half though and add chocolate chips. Let your inner Mid-Westerner out. PS. I can’t believe I found this cookbook online. My dad would chuckle. You can buy canned pumpkin online eh? Take that grocery stores who always run out. Oh, the poor grocery stores. Forget the Uggs. I want things like this in my closet. Role up the bottom of your jeans. Wear a sweater. Strut your stuff. I’m just currently drooling and did not actually buy these beauties. Oh? You want to send me a pair? Sure! I’m a size nine. Sure, I have lots of mixed opinions on the NFL and football players safety and their rattled noggins. It seems that any industry these days is having its fair share of controversy, and people have to be brave to take a stand. Cheers to those practicing their rights to pray on the field. For me, right now, I’ll just take comfort in the noise of the game on a Sunday. Sunlight streaming in in the afternoon. Memories of my dad. The announcers voice. A beer with my father-in-law – probably a Blue Moon or a Michelob Ultra. Back against the couch, legs sprawled on comfy carpet. Loved ones around. All good, and beautiful things. Here is the awareness that I experienced this week. I hate being a beginner. I like, instead, having accomplished a level of mastery that is comfortable, predictable, and extremely safe. However, life continues to give me some grand opportunities to begin again, pushing me down my tunnel of safety into unknown land of what the heck am I doing? I almost cried this week while staring at a budget worksheet for a proposal I’m working on. Is this ever going to get easier? I wanted to throw the paper down and wipe my tears in the hallway bathroom. Instead, I tried again, and after two hours, the numbers finally added up in their columns appropriately. Other areas of being a beginner? Owning a home – luckily my husband is very zealous about projects and maintenance. I instead plan meals from the couch and feel a little anxious about water heaters and home warranties. Being a wife – in the grand scheme of things, I’m still pretty new at this. Hence why I sit on the couch and plan meals. Wives do that right? I have a new job. I’m more than six months in, but still learning a new skill, navigating a new team of people, and trying to balance my desire for leadership with lack of experience. Hence my tears over a budget worksheet. Being a child that is an adult – maybe some people get used to this way before I did, but navigating relationships as an adult with both parents and in-laws can be fun and a little unclear. Is it ok to ask for help? To have my father-in-law doing our electrical and still eating dinner with my dad on a Wednesday night? I hope so. Making new friends – this year I’ve watched numerous people I care about continue their own journeys, moving away, and going in different directions. I feel this has left a void in my own life, and I want to build new relationships. This process is awkward, requires risk, and vulnerability. Do you want make new friends too? Come over, let’s have a dinner party. There is beauty in beginning. In admitting I don’t know quite what I’m doing, but I am trying to bring new and prosperous things to my life. At times, no all the time, I’m uncomfortable, but am finding ways to say learning is often an uncomfortable process. There is beauty here. Something I am not new at is enjoying the full radiance of October, my favorite month. I can quote Anne of Green Gables like the rest of us, and I look forward to boots and sweaters and the return to hot coffee over iced. I haven’t brought out my sweaters yet; the weather is still over eighty degrees. I am loving the beauty of the Colorado blue skies splashed with aspens changing, and the rich hues that the trees offer as they transition into their resting space. I need to buy a bag of candy corn and eat it nibble by nibble, one color segment at a time. I look forward to these precious thirty one days each year. Chili and pumpkin bread, and crock pot meals are promising. There is something magical in this season of transition, when the mornings are cool and the sun rises later making me wake in darkness. I anticipate the return of cozy nights with blankets and big glasses of red wine. These are beautiful elements of my world that I can create and choose to participate in. 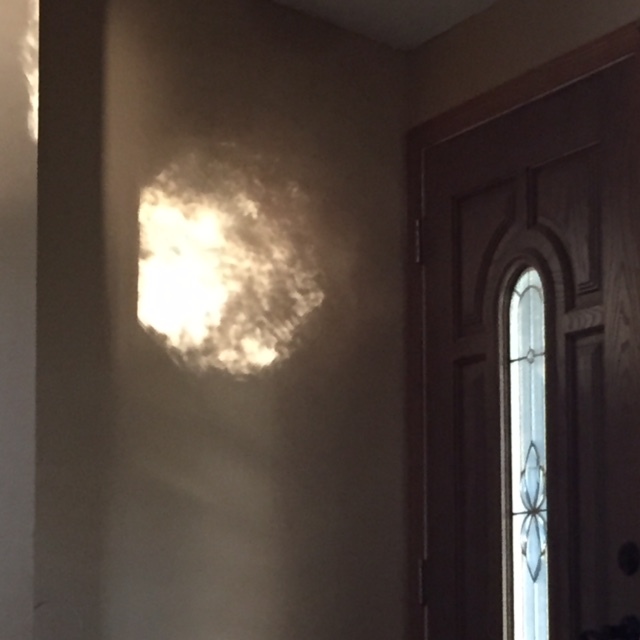 As I sit and write today, the light is dancing on my wall through the glass on our front door. The shadows move back and forth, glamorously sharing their own beauty as the leaves wave in the autumn wind. Observing these little things bring peace. I don’t feel particularly purposeful in this moment, but maybe just sitting and watching the leaves dance and bring their own beauty to my living room wall is enough. What are you beginning? What makes you feel like you are enough? No baked goods or manicures this week. However, this mac and cheese in the crockpot is delicious.